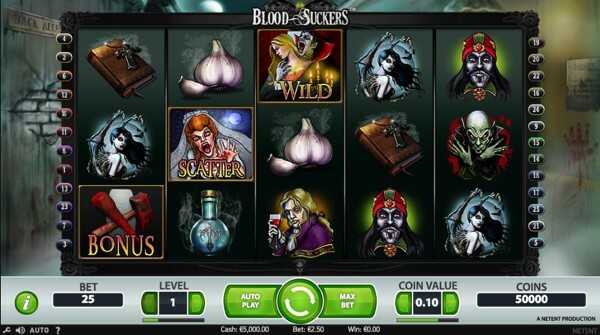 The Blood Suckers video slot is the answer to all things vampire, providing a blood-laced, eerie video slot experience that will not disappoint if you’re a fan of horror movies. Developed by Net Entertainment, Blood Suckers is presented on 5 blood-dripping reels with three rows and features 25 pay lines. This video slot provides a throwback to the Victorian vampire genre and comes packed with several bonus features including scatter symbols, wild symbols, a gloomy bonus game, a bridal free spin feature and a top paying jackpot bonus worth 7,500 coins. The background illustrations are extremely detailed, somewhere between fine art and cartoonish, providing loads of colourful accents and lots of shading against a rather dark backdrop. The name of the game relates to vampire-like characters and Dracula with every single symbol relating to this genre. The lower valued symbols include a clove of garlic, a bloodied bow, and arrow, a blue potion vail, a brown bible with a silver cross and an antique pistol. The high valued symbols are four different characters including a female vampire with wings, a handsome vampire, ponytailed man, a grey vampire with long black hair and a green-skinned creature with long pointy fingers and ears. Blood Suckers has an incredible selection of betting options and features four different betting levels to choose from. You can play between 1 and 25 pay lines per spin and the minimum you will be able to place on a pay line starts at £0.01 and can go as high as £0.50. The minimum bet that will cover all pay lines start at £1.00 while the maximum you can bet on a single spin is £50.00. The vampire biting a gorgeous girl acts as the wild symbol and will stand in for all other symbols except the scatter and bonus symbols. The scary-looking bride represents the scatter symbol while the bloodied stake and hammer icon acts as the bonus symbol in the game. The bonus game is triggered by displaying three bonus icons on an active pay line. Once triggered, you will be transported to a dark and mysterious room where 12 unopened coffins are presented on the floor. You will need to click on several coffins to reveal one with a vampire. If you manage to locate a vampire, a stake will skewer him to earn you some cash prizes. Once you click on an empty coffin, there will be several bats flying around to show that the bonus game is over. Displaying three or more bridal scatter symbols anywhere on the reels will activate the free spin feature. Once activated, 10 free spins will follow, and all winnings earned during the free spin feature will be tripled. You can also re-trigger this feature by displaying three more bridal scatter symbols on the reels. Blood Suckers provides a gruesome and entertaining experience that is overall extremely visually appealing to those who enjoy a blood-laced gaming experience. The Return to Player has been set to 98.00%, providing some incredible pay outs on a frequent basis, especially with the volatility level sitting between the low and medium variances. Below you will find a demo-version of Blood Suckers and a couple of recommendations of good casinos that offer the game.